An interesting example of a meditation on what Ian Bogost calls "procedural rhetoric" has to do with reflecting on the seemingly straightforward process of making tea. 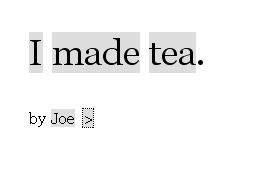 Joe Davis's stretchtext piece, Telescopic Text, provides its own kind of electronic tea ceremony as the individual components of a cup of tea are expanded upon. Over the years I've seen several versions of Ted Nelson's concept, from the Tinderbox Stretchtext Template to an opening of file-folders version of "He Began. She Ended." by Jeremy Douglass, but this was a particularly interesting connection of the content to the form. After all, I used to carpool to work with a philosopher who once studied assembly language, although he felt that his most memorable project was an algorithm for making tea.